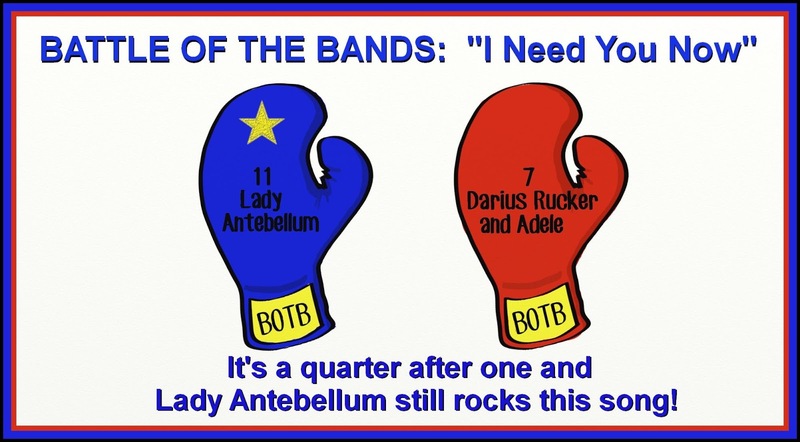 Cherdo on the Flipside: BOTB Results: "I Need You Now"
That's right, peeps everywhere: Maroon 5 may have been able to steal Alicia Keys' thunder on her own song last time, but Lady Antebellum ain't a-gonna let that happen twice! The words for April are SHORT and SWEET! Now hop over to check out the other battles and see what they are up to. Did your vote come out on the winning side? Are you on a roll? Has anyone collapsed under the weight of the Battle of the Bands, A-to-Z, and their othwer blog hops? And what about Naomi (insert obscure Mary Hartman, Mary Hartman reference, just to mess with ya)? That was a great BOTB! 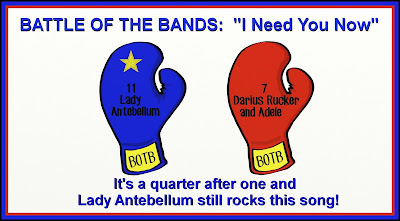 I didn't vote on this one, but love Lady Antebellum. So they are the winners! Glad I picked a winner. Love this song. They do it awesome.